November 27, 2011  A group of human rights activists in Mexico has asked the International Criminal Court in The Hague to investigate President Felipe Calderon in connection with the deadly war on drug cartels. The complaint, spearheaded by human rights lawyer Netzai Sandoval, claims war crimes have occurred. The complaint was filed a day after two dozen bodies were found dumped in Guadalajara. 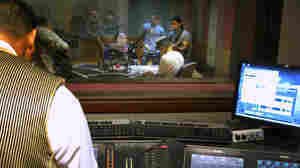 NPR's Jason Beaubien has more. November 22, 2011  Across Latin America, movies and soap operas have glamorized the lives of drug lords and their gangs. A new Mexican movie, Miss Bala, takes a realistic look at the fear that grips many Mexicans today. November 20, 2011  The U.S.-Mexico border region could be the key to rejuvenating manufacturing in North America. Business are betting that quick delivery times and agile, streamlined companies will have a competitive advantage over Asian firms. 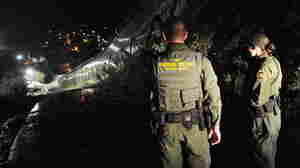 November 9, 2011  The U.S. deported a record number of illegal immigrants last year. Many were released in Mexico's dangerous border cities, which are struggling to provide even temporary shelter. November 6, 2011  Nicaraguans voted Sunday to elect their next president, but incumbent Daniel Ortega made sure he's the front-runner as he seeks an unprecedented third term. The Supreme Court declared the constitution's two-term limit unconstitutional. 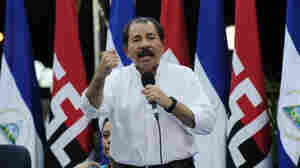 November 6, 2011  Nicaraguan President Daniel Ortega's critics call him a dictator. His supporters say he's a revolutionary populist. As NPR's Jason Beaubien reports, Ortega is defying both a constitutional two-term limit on presidents and a ban on serving consecutive terms to run for an unprecedented third term. The election is Sunday. November 5, 2011  Daniel Ortega has been one of the most prominent figures in Nicaragua for three decades and is running for a third term as president. 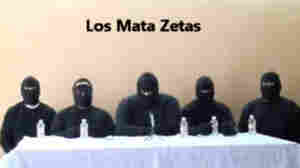 "Los Mata Zetas," or the "Zeta Killers," described themselves in a recent video as a paramilitary group that will go after members of the Zeta drug cartel. The Mexican government, however, has described it as a rival drug cartel that is just seeking to eliminate competition from the Zetas. October 26, 2011  The drug violence in Mexico has claimed another victim, the port city of Veracruz. The recent bloodshed is crippling tourism and sowing fear in what, until last year, had been a relatively peaceful part of Mexico. But in a twist, a group calling itself the Zeta Killers is vowing to fight the drug cartel. Mexico has launched a publicity blitz to attract more tourists. The vast majority of tourists travel to just one of a half-dozen destinations in Mexico — including Cancun, shown here last year — far from the drug violence. October 18, 2011  The drug war has created an image problem for Mexico. But a record number of visitors are flying into Mexico's resorts, investors are plowing money into new hotels, and most tourist spots remain safe from the country's drug violence. However, fewer Americans are driving across the border. 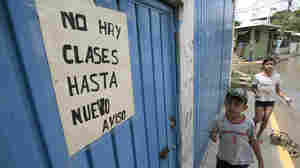 September 28, 2011  In Mexico, drug-related violence has delayed the opening of hundreds of public schools in the coastal city of Acapulco. Teachers who say they're facing threats of extortion and kidnapping are refusing to return to their classrooms. September 21, 2011  Gunmen in Mexico have dumped 35 bodies under an overpass on a main street in the Gulf Coast city of Veracruz. The victims showed signs of torture. September 14, 2011  In Libya under Moammar Gadhafi, the regime strictly controlled what images were allowed in public, and anti-government graffiti was met with a harsh response. 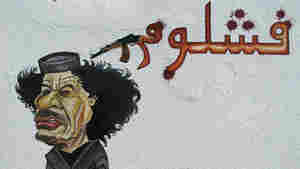 Now, graffiti denouncing Gadhafi and declaring Libya "free" is everywhere. September 12, 2011  In Libya, the airwaves have been liberated from years of control by the regime of dictator Moammar Gadhafi. Now, Libyans can hear foreign radio broadcasts, express themselves freely on call-in shows and listen to music with messages that would have once gotten them thrown into prison. September 12, 2011  In Libya, there's growing concern over the vast arsenals of weapons that have flooded the streets since Moammar Gadhafi's ouster. 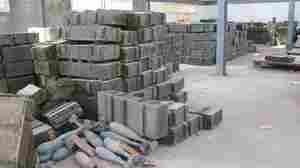 Warehouses of surface-to-air missiles, mortars and anti-tank mines have been looted. U.S. military officials worry the weapons could flow out of Libya and into the hands of terrorists. September 8, 2011  The Libyan capital Tripoli is rapidly rebounding from the fighting that ousted Moammar Gadhafi from power. Less than three weeks after the rebels launched their assault, shops are re-opening, water and electricity are back on, garbage is getting cleaned up and new city officials are working to re-establish security across the city.